Gibson, Robert D. IV, “Butch” (August 29, 2018). Beloved husband to Mary Ellen R. (nee Wolfington). Loving father to Jennifer E. (Marcus) Wallace, William J. (Maureen) Gibson, and Catherine L. (Adam) Levine. Grandfather of 7 Raya, Ethan, Robert, Cameron, Jake, Lauren, and Peyton. He will also be missed by his sister Bonnie (Mary Connell) Gibson. Butch was a Phillies fan and avid fly fisherman. He served as a Captain in the Army and Vietnam Veteran. He also was a Long-time employee at Aetna as a marketing manager for the C.H.I.P. program. Butch Enjoyed weekends at Beaverkill in the Catskills. Relatives and friends are invited to his Memorial Service Thursday September 6th, 11am Craft Funeral Home of Erdenheim, 814 Bethlehem Pike, where friends may call 9am. Interment Private. 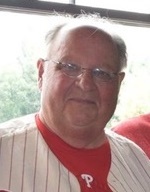 In lieu of flowers contributions in Robert’s name may be made to Oreland-Wyndmoor Little League, PO Box 125, Oreland, PA 19075.
in my heart and prayers as you move through your grief. to keep his spirit alive in you. Butch, miss you already. Beaverkill trips won’t be the same. Who will be the voice of reason and sanity? Thanks for teaching me how to catch trout with a fly. Your friendship was a blessing.